JPCA Show 2019/Total Organic Devices Expo 2019/WIRE Japan Show 2019/2019 Microelectronics Show/JISSO PROTEC 2019 will be hosted in June at Tokyo Big Sight, which is located in Tokyo where the average temperature around this period is about 22° Celsius, one of the most pleasant seasons, the beginning of summer. However, please be aware that there is a possibility of rain during the month of June so it is recommended that umbrellas and / or other rain gear be prepared. Although Japan is well known for its advanced technology, it is a country that is also rich in tradition and culture. Gaming, anime, fashion and other entertainment activities are just some examples of how Japan has fused technology with tradition. Japan is also a place where cuisine from all over the world can be enjoyed to create a rich environment for a splendid culinary experience. All of these possibilities enable visitors to enjoy Japan through its many facets. Please refer to the sites below for information on culture, history, tourism, etiquette, dining, entertainment and shopping in Japan. Welcome to "Japan, Endless Discovery" the official guide that helps you during your visit here. Plan a tour of Tokyo, travel to Kyoto or visit any other Japanese city with handy information on trip planning, culture, festivals, tours, guides, history, and much more. Plan your Japan tour today with Japan, Endless Discovery. Standard Time of Tokyo is 9 hours ahead of Greenwich Mean Time. * Please note the there is no daylight savings in Tokyo. Tokyo offers a splendid array of dining options from traditional and contemporary Japanese food to fine cuisine from around the world. Gourmet Navigator will help you find that perfect restaurant in Japan! Just specify your area and desired cuisine for a quick and easy list of choices. If you're hungry in Tokyo, you can find listings for more than 1000 restaurants, cheese shops, wine bars and bakeries here. We've got fresh reviews, food and wine news, and full listings that can be browsed by neighborhood, cuisine and / or feature. The Tokyo metropolitan area is easily accessible by train from Tokyo Big Sight. 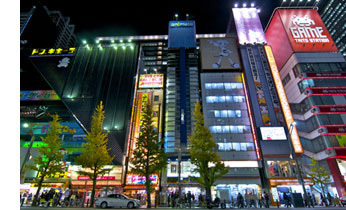 All of the following areas can be reached in one hour or less: Ginza (Tokyo's main shopping district), Shinjuku (a mecca of high-rise buildings and entertainment), Akihabara (electronics shops), Harajuku (the center of Tokyo's pop-culture), Shibuya (the playground for Tokyo's youth) and Roppongi (Tokyo's lively night scene district). Please refer to the links below for more information on Tokyo and its unique districts. Download mobile application software Now! A travel guide to Japan, featuring famous sightseeing places and hotel booking, etc. Widely distributed English-language magazine with a focus on entertainment, events, and Japanese culture. 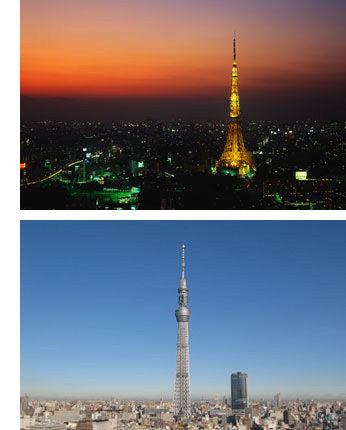 Tokyo travel news from our insiders at CNN Go makes finding the real Tokyo a breeze. Follow us for the best recommendations on where to sleep, eat and drink. Japanese government site providing information for online budget hotel reservations, regional guides, convention locations, museums, etc. Welcome to Akihabara, today's most famous Electronics Town, where you will find a wide range of contemporary electronic appliances at far cheaper prices than anywhere else in Japan. This website is brought to you by the Akihabara Electrical Town Organization. Odaiba is favorably located, and encompasses a various facilities. Odaiba’s attractions include “palette town” (Wonder wheel), “Venus Fort”, “Aqua city”, with modern and old-fashioned stores. This area also contains the architecture of the Fuji Television Station and the “O-Edo Onsen Monogatari”, etc. Those facilities offer all kinds of entertainment. Ginza is an elegant and stylish city. It has many old stores full of history and traditional as well as prestigious boutiques. This name “Ginza” comes from the [Ginza Yakusho], where the mintage and the silver metal were handled in Edo era. Ginza 4-chome is known as the most expensive land in Japan. Built in 1958, Tokyo Tower is a communications and observation tower that stands 333 meters tall. The tower is the symbol of Tokyo and a point of interest for tourists visiting the city. On clear days, Mt. Tsukuba and Mt. Fuji can be seen from its observation decks. Boasting a height of 634 meters, the tower will be one of the world tallest. The figure “634” can read “Musashi” in Japanese. Musashi is former name of this region. In July 2011, the current analog broadcasting ended and a complete transition was made to digital broadcasting. A large shopping complex with aquarium is located at its base. With over a half century of experience introducing the beauty and history of Tokyo, the name Hato Bus has become synonymous with Tokyo tourism - offering visitors the most convenient and fun tours ever. The unit of currency in Japan is JPY. Please be aware that many stores in Japan accept cash only. Therefore, it is advised that visitors carry enough cash during their stay in Japan. Coin denominations are 1, /5, /10, /50, /100 /500. Bank notes are 1,000, /5,000, /10,000. The exchange rate is approximately 100 JPY to US $1.00 as of November 18, 2013. Currency can be exchanged at local banks, airport and hotels. The most convenient location for currency exchange is at the airport. Hotel staff can usually arrange for a doctor or an ambulance. If you’re on the street when disaster strikes, ask a passerby or a Japanese policeman if you don’t feel comfortable doing it yourself. Many embassies from around the world are located right in the heart of Tokyo. For passport issues or emergencies, please contact the relevant embassy.